The Treasury could be paving the way for the end of 1p and 2p coins as it seeks views on the future of cash. It is inviting comments on the mix of coins in circulation as consumers move to non-cash payments such as contactless and digital spending. Ministers say there are no current plans to scrap them. But the consultation hints at the growing cost of handling these coins. It also questions the validity of the £50 note. Many countries - including Canada, the home of the current Bank of England governor Mark Carney - have ditched their low denomination coins. Australia, Brazil, and Sweden are among many others to do so. The document points to surveys that suggest six in 10 of UK 1p and 2p coins are only used once before being saved in a jar or discarded. In one in 12 of these cases, the coins are thrown in the bin. "From an economic perspective, having large numbers of denominations that are not in demand, saved by the public, or in long-term storage at cash processors rather than used in circulation does not contribute to an efficient or cost effective cash cycle," the Treasury consultation document says. Previously, the government and the Royal Mint have needed to produce more than 500 million 1p and 2p coins each year to replace those falling out of circulation. However, the coins are now being used less often and being held in greater numbers by coin processing businesses, as consumers move to non-cash payments. The penny coin: Should we follow Ireland and phase it out? The value of the 1p coin has also been reduced by inflation so, in effect, the 1p coin is now worth less than the halfpenny when it was abolished in 1984. 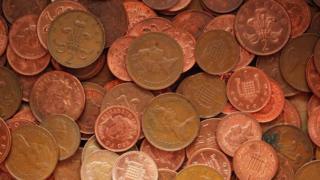 The 1p coin is legal tender for amounts up to 20p, so it is not permitted to pay debts with a sack full of pennies. The document also questions the need for the £50 note, which it suggests is rarely used for purchases. However, there is significant demand from overseas for these notes, where they are saved alongside dollars and euros. "There is also a perception among some that £50 notes are used for money laundering, hidden economy activity, and tax evasion," it says. Despite seeking views on the future of cash, the Treasury says that coins still have a vital future in the UK. Research suggests that 2.7 million people in the UK are entirely reliant on cash. "The government is committed to ensuring that the public's cash needs continue to be met," the document says. BBC Business has set up a new UK Facebook group all about affordable living. From tuition fees, paying off student loans, finding a job, and travelling to work to renting and saving for your first home - it is a space to share your experiences. Join the Affordable Living group here.